Burn Mini DV to DVD/Blu-ray disc/ISO//BDMV folder. Real-time preview before DVD or Blu-ray burning. 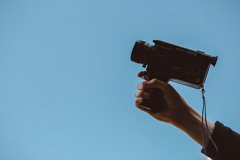 DV is a format for recording digital video with camera recorders, which is co-developed by the leading camcorder producers like Panasonic, Sony, JVC, etc. While some camcorders directly record video to DVD, there are many camcorders store DV videos to flash memory cards and hard disk drives. It's actually inconvenient for us to watch DV/Mini DV videos without a camcorder. 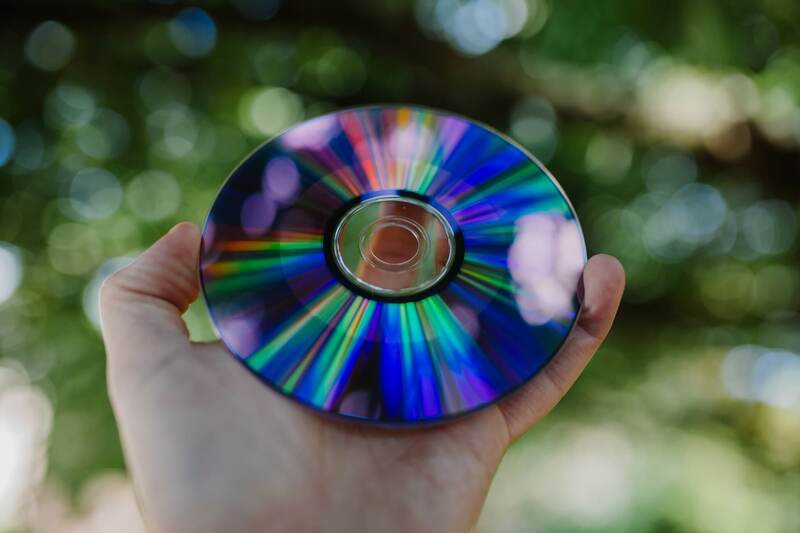 So many people try to find some methods to convert DV/Mini DV to DVD or other video formats so that they can watch their precious videos on TV or other playable devices. If you're one who looking for an easy and cheap way to burn DV/Mini DV to DVD, you are on the right page now. 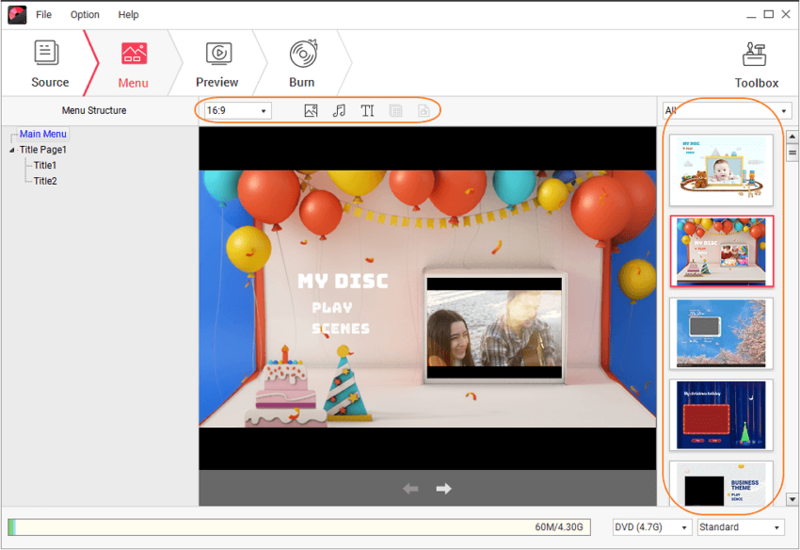 Wondershare DVD Creator is an all-in-one DVD tool to help you burn Mini DV/DV to DVD with simple steps and customized features. You are allowed to add Mini DV videos to DVD directly from any camcorder, and what you need to prepare is just a Firewire or USB cable to connect your DV camcorder to your computer. 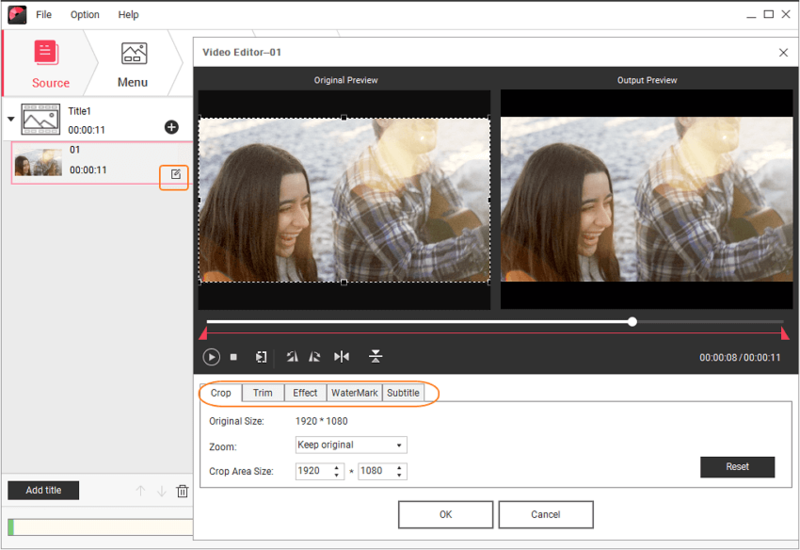 Wondershare DVD Creator provides you the built-in video editor so that you can crop or trim the video parts you don't like. It also offers you 100+ free DVD menu templates with different themes to make your DVD more creative. What's more, this software has many additional functions such as burn videos to ISO, burning data disc, making photo slideshow, video editor, and more. · Burn MiniDV/DV videos to DVD/ISO/DVD Folder/Blu-ray Disc/Data Disc easily and directly. · Personalize DV/Mini DV videos by trimming, cropping, adding subtitles, applying effects, etc. · Customize DVD menu by creating chapters, changing background music or picture, editing thumbnail, adding text, etc. · Offer 100+ menu templates with style of Sport, Movie, Standard, and others. · Additional built-in functions like ISO to DVD, Create Data Disc, Photo slideshow, DVD copy, DVD to Video, Video editor are supported. · Convert MiniDV to DVD with super fast burning speed and high-quality output. Before you start burning your DV or Mini DV videos to DVD, you should first connect your DV camcorder to your Windows system computer via a USB/Firewire cable, then you can add your files to DVD directly. For Mac users, you should copy your DV videos to your Mac first by iMovie or other tools, then follow the similar steps below to transfer DV or Mini DV videos to DVD on Mac. Step 1 Launch Wondershare Mini DV/DV to DVD converter. 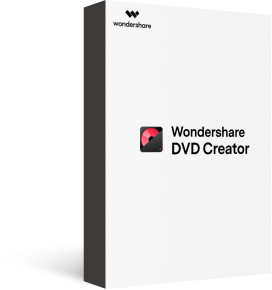 Download, install and launch Wondershare DVD Creator on your PC first, then choose Create a DVD Video Disc option to continue following steps. Step 2 Import DV/Mini DV videos to DVD. You'll come to a new interface under the Source tab, click the " + " icon on the interface to open the file browser, you can find your DV/Mini DV files under the removable disk if you have connected your camcorder to PC successfully. Select and add videos you want to burn. Or you can import DV/Mini DV files by clicking the File button on the left-top corner, and choose Add from phone... option to open the Import from Device interface. All your videos and images will be scanned and displayed here, choose what you need and click Add to import. 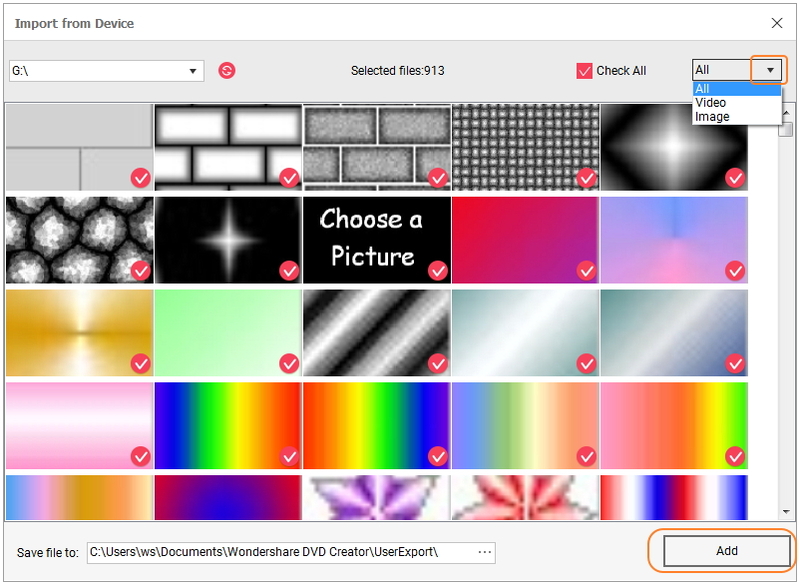 Usually video editing is necessary, you can use Wondershare DVD Creator to customize your DV/Mini DV videos by trimming, cropping, applying effects, adding watermarks, and so on. To access the Video Editor window, just click the pencil icon on the thumbnail which is left on the interface. Step 4 Customize Mini DV to DVD menu template. Move to the Menu tab and select a menu template for your MiniDV/DV to DVD conversion. Double-click to apply a template from the 100+ menu template designs on the right of the screen. 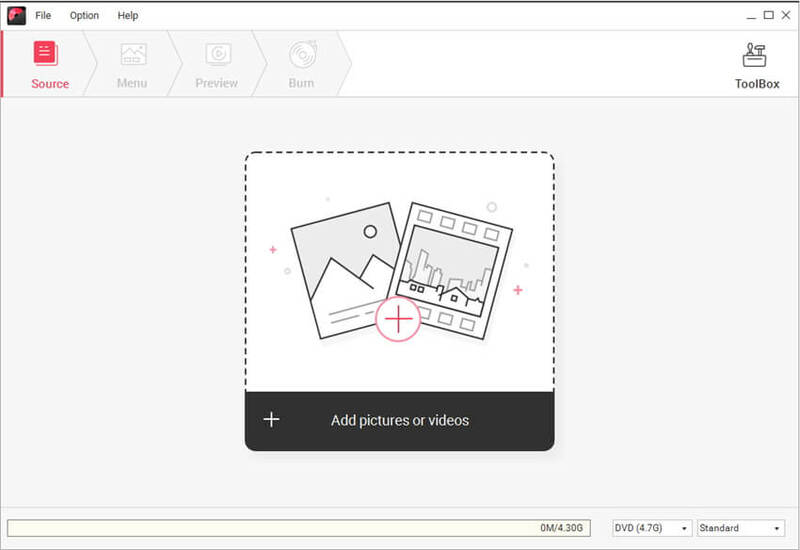 You can further customize your menu template with image, picture, text and others by hitting related icons. Step 5 Preview and burn MiniDV to DVD. Click Preview tab to preview your DV to DVD creation. Just feel free to back to Source or Menu tab to make changes if needed. Finally, move to the Burn tab and make sure that there is already a blank disc in your PC. Choose Burn to disc option to complete Burn Settings including disc label, burner, TV standard, etc. You can just click the Burn button to start burning MiniDV/DV to DVD. The used space of the disc will be displayed at the bottom. You can choose the size of burning DVD between "DVD-4.7G" and "DVD DL-8.5G" for DVD burning. Choose your DVD output quality with "Fit to Disc", "Standard" and "High Quality". With professional DV to DVD Creator, you will find it pretty easy to burn DV video to DVD so that you can enjoy shoot videos with your family at home. Another common way for us to convert Mini DV/DV files to DVD is using a DVD Recorder. It maybe the most direct and professional way to copy Mini DV tapes to DVD. Make sure that you have a Firewire to connect your DV or Mini DV camcorder to DVD recorder. But DVD Recorder products are always expensive, if you have only several Mini DV files to convert, then you can choose burn with Wondershare DVD Creator or ask charged DVD service for help. Next we will learn how to copy DV/Mini DV tapes to DVD with DVD recorder. Step 1: Connect your camcorder with DVD Recorder via a Firewire or HDMI cable. Connect camcorder with output while DVD recorder as input. Step 2: Insert a blank DVD into the DVD Recorder and switch it to AV-in mode, then put the DV/Mini DV tapes you want to convert into the camcorder. Step 3: Press Record button on the DVD Recorder and start playing your Mini DV videos. Press the Stop button once you want to stop recording. Different DVD Recorder devices may have a little differences in operating steps. But the key points are similar-connect camcorder with DVD recorder, set input and output, then start recording. Click 10 Best DVD Recorder in 2018 >> to know the top 10 DVD Recorder. DV: In a DV file, the video, audio and metadata are stored in Digital Interface Format (DIF) blocks which is the basic units of DV streams. DIF blocks can also be saved to computer files in raw DIF format (*.dv, or *.dif) or encoded to popular file formats as Audio Video Interleave (.avi), QuickTime (.mov) and Material Exchange Format (.mxf). Magnetic tape is the media used by camcorders to record videos, including MiniDV, DVCAM-L, DVCPRO-M, Digital8, etc. MiniDV: It refers to the tape or the media to record your videos by camcorders. While DV is the standard format complied with by all camcorder manufacturers who use MiniDV tape as recording media. Therefore, while we're saying MiniDV to DVD or DV to DVD, it's the same: you burn camcorder videos to DVD for preserving or playing on TV.